Another turning point emerges, as Rebecca at last reaches Deborah in the present day narrative. At this point at least, Deborah’s curiosity and love for her mother and sister prove stronger than her paranoia. Deborah and Rebecca meet in July 2000 in Baltimore. Rebecca shows Deborah a gift from a Hopkins cancer researcher named Christoph Lengauer. Having heard about Rebecca’s research, and having worked with HeLa for years, Lengauer has expressed remorse about the fate of the Lackses. At last, Deborah and Rebecca—whose relationship sits at the heart of the book’s conclusion—meet. Lengauer has been working with HeLa for his entire career. As a student, he helped develop a technique to artificially color chromosomes in order to obtain info about a person’s DNA; the technique also “creates a beautiful mosaic of colored chromosomes.” Lengauer has done this with Henrietta’s chromosomes, and has framed a large print for the Lackses, in order to express how grateful he is to them. This brief tale of Christoph Lengauer is an inspiring one, and in many ways a parallel to Skloot’s own journey—becoming independently fascinated with Henrietta during the course of his own research, and then seeking out the Lackses in order to tell their story and offer thanks. Deborah is surprised by how beautiful the chromosomes look, and expresses a desire to learn more about what HeLa helped to create. Rebecca invites Deborah to Lengauer’s lab, but Deborah says that she’s not ready yet. She once again expresses dismay that “white folks” got rich off of Henrietta’s cells while the Lackses remain poor. The picture has symbolic as well as aesthetic meaning for Deborah, as it shows that at last someone in the scientific community—even if it’s only one person—is expressing gratitude and remorse for what happened to her mother. This picture will continue to be an important artifact as the narrative continues. Deborah then shows Rebecca all of the research that she’s done on Henrietta. Within the papers is a Mother’s Day card that Deborah has written to Henrietta, as well as many articles. Deborah expresses suspicion that Hopkins is still experimenting on “black folks,” and wonders if they have cloned Henrietta without telling her family. Rebecca tries to explain that scientists have only cloned Henrietta’s cells, but Deborah doesn’t believe her. Rebecca explains that Deborah’s conception of science fiction versus reality has blurred. Deborah’s muddled research, which includes newspaper articles, records, and the Mother’s Day cards, emblemizes how much Deborah’s grief and sense of loss is mixed in with her curiosity about HeLa. Skloot also begins to discover just how much misinformation Deborah has received over the years, and how little she knows about the actual scientific facts surrounding HeLa. Deborah visits Rebecca for the next three days, but Rebecca is constantly worried that Deborah is going to change her mind and stop talking. Instead, Deborah speaks endlessly, and Rebecca describes her various eccentricities. She explains to Deborah why Victor McKusick wanted her blood, and Deborah expresses frustration that he didn’t tell her in the first place. The two women grow friendly, but when Rebecca reaches for a file containing Henrietta’s medical records, Deborah becomes paranoid and hostile. As Rebecca learns more about Deborah, she comes to see just how deep Deborah’s paranoia and anxiety goes. Unlike the doctors and reporters who have come before her, however, Rebecca shows real compassion in dealing with Deborah. Whenever the other woman grows overly suspicious, Rebecca always displays openness and honesty in order to regain her trust. It seems that it’s just openness and honesty that the Lackses have wanted, and been denied, this whole time. Hoyt-Disick, Gabrielle. 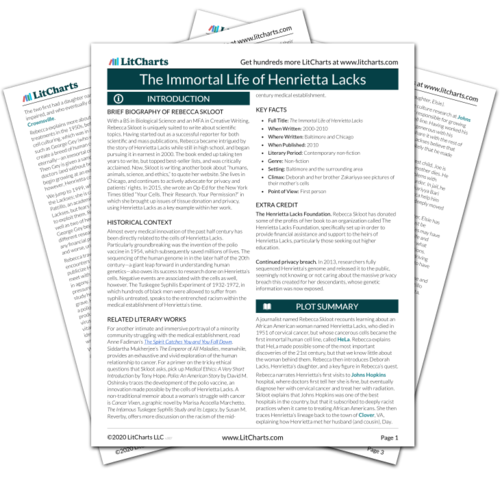 "The Immortal Life of Henrietta Lacks Chapter 29: A Village of Henriettas." LitCharts. LitCharts LLC, 29 Jun 2016. Web. 19 Apr 2019. Hoyt-Disick, Gabrielle. "The Immortal Life of Henrietta Lacks Chapter 29: A Village of Henriettas." LitCharts LLC, June 29, 2016. 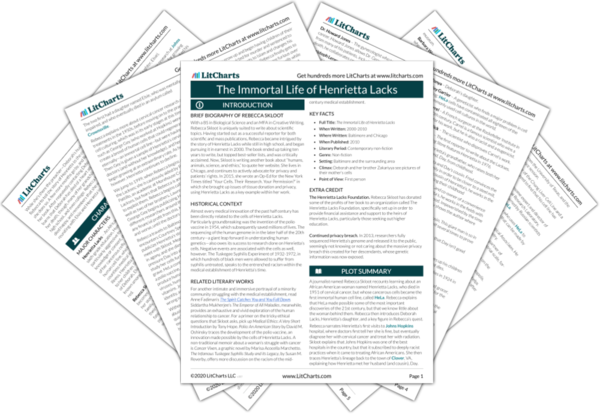 Retrieved April 19, 2019. https://www.litcharts.com/lit/the-immortal-life-of-henrietta-lacks/chapter-29-a-village-of-henriettas.